Steven Gerrard wants Rangers to embrace the hostile atmosphere at Celtic Park as he seeks back-to-back derby wins. 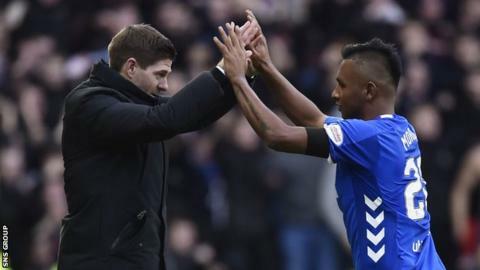 Rangers moved level with Celtic after a 1-0 success at Ibrox at the end of December but have since slipped 10 points behind the Premiership leaders. With just 800 away fans present, both of this season's prior meetings have been dominated by the home side. "You have to thrive in this, if any of my squad don't fancy it, they are at the wrong club," said Gerrard. "A set of fans can make a noise and create an atmosphere. I've never known a fan to win a match. "It's an opportunity for the players to show our fans that they are out there playing for them." Rangers' last win at Celtic Park came in October 2010, while the champions are unbeaten at home in the league this season, with 14 wins and one draw. "It will be a fascinating match," said Gerrard. "Celtic have a very good home record but we feel confident going there. "We'd like to be the first team, domestically, to go there and take three points. I think our best performance can achieve that. "We have to take confidence from the last time the teams went head-to-head. We won't have the power of Ibrox behind us but the players have got to have the mentality and confidence that they can go there and do the same job. "We felt the last time we were there we maybe showed them too much respect. We stood off them too much, certainly in the first 45 minutes." The former Liverpool captain revealed that he "preferred away trips" to Everton and Manchester United during his playing days. "I thrived on the pressure, the intimidation, the verbals; just because it was a better feeling winning a derby away from home," said Gerrard. "That's mentality the players have got to have. We can't think 'we haven't got many fans there, no one is cheering us'. The players have got to stick together and pull each other along." Left-back Borna Barisic is ruled out after suffering a hamstring injury while playing for Croatia. However, Gerrard is optimistic midfielders Ryan Jack and Scott Arfield will both be back following calf problems. Gerrard explained that assistant manager Gary McAllister will miss the derby after being attacked in Leeds last weekend. The former Scotland captain needed hospital treatment after being punched and a man was arrested in connection with the incident before being released under investigation. "I took the decision out of Gary's hands," said Gerrard. "It's a shame what happened. "He is recovering well, but I think it's better that he rests and recovers and gets himself 100% right, and we get Gary McAllister back when he can be the real Gary McAllister." Meanwhile, Gerrard says he is unaware of any valuation being put on Ryan Kent following reports that Rangers will be priced out of a summer move for the on-loan Liverpool winger. The 22-year-old has scored five goals in 37 appearances for the Ibrox side. "I've read the rumours and speculation," he said. "I'm not sure who has put that price on Ryan. Whether it's his agent or Liverpool, I haven't heard anything on that. "My focus is on Ryan Kent being available for the weekend and I'm pleased he's available. In terms of the future and moving forward, that decision is out of my hands. "Liverpool know we want him here, the player knows we want him here, his representation know we want him here. But in terms of the decision it's not down to me. I wish it was but unfortunately it's not."